Chocolate dipped waffle ice cream cones coated with peanuts, sparkles or plain chocolate on display at Cow's in the town of Niagara-on-the-Lake in Ontario, Canada. 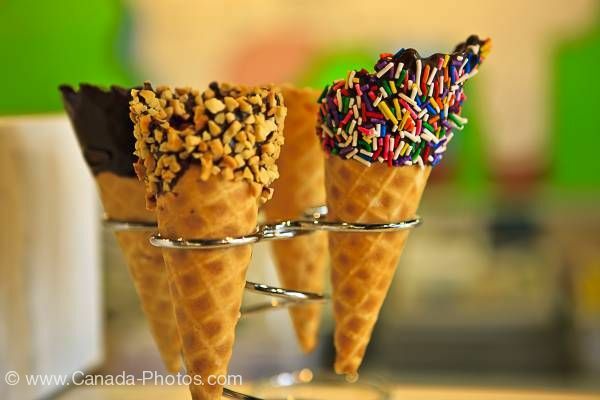 The waffle cones are very tempting and with a scoop of the best ice cream in Canada, let your taste buds be the judge of this amazing treat. Cow's ice cream has been selected the best throughout Canada originating in Prince Edward Island in 1983. An old-fashioned family recipe from PEI which became extremely popular with a choice of over 32 flavors of ice cream, each one being served in a hand made waffle cone. There are 7 stores in PEI, with others being in Halifax, Banff, Whistler and the most recent addition in the town of Niagara-on-the-Lake. Chocolate dipped waffle ice cream cones at Cow's in the town of Niagara-on-the-Lake, Ontario, Canada. Picture of various types of chocolate dipped waffle ice cream cones at Cow's in Niagara-on-the-Lake in Ontario, Canada.